A Visionary is someone who sees into the future; Taylor Forrestier sees into the past but only as it pertains to her work. Hailed by her peers as“a visionary with an instinct for beauty and an eye for the unique” Taylor is undoubtedly a brilliant architect and gifted designer. But she and twin brother Trevor, share more than a successful business. The two share a childhood wrought with lies and deceit and the kind of abuse that’s disturbingly prevalent in today’s society. Can the love of God and the awesome healing power of His grace and mercy free the twins from their past and open their hearts to the good plan and the future He has for their lives? 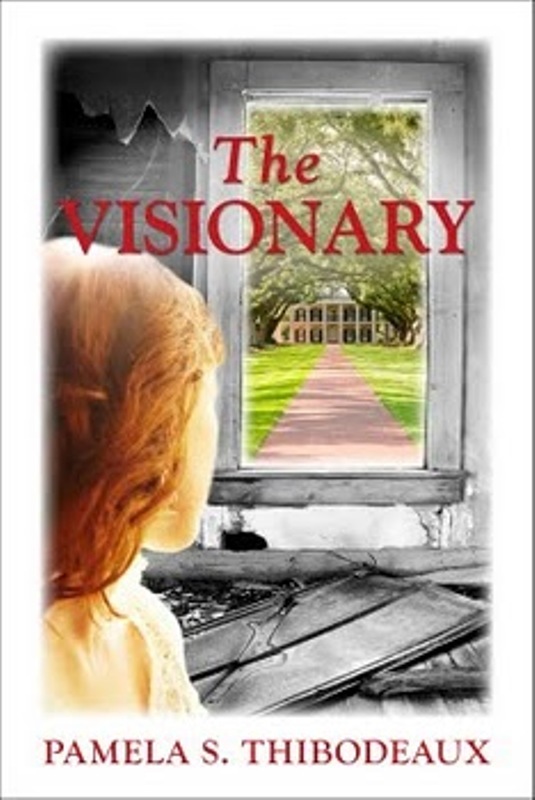 Find out in…The Visionary ~ Where the awesome power of God’s love heals the most wounded of souls. . Check out these anthologies Pamela has contributed to! Few of God's creatures are as noble and soul-stirring as the horse. Even those of us who don't have horses of our own love to read inspiring stories of these beautiful, regal beasts. With contributions from well-known authors such as Lauraine Snelling, Susy Flory, Rebecca E. Ondov, Wanda Dyson, and Sarah Parshall Perry, these true stories of horses and the people who love them are sometimes touching, sometimes humorous, and sometimes miraculous. As she did in her dog and cat story collections, Callie Grant Smith has compiled another perfect read for animal lovers--time with horses as the subject. "Soul Therapy" / The Horse of My Heart is available now from Amazon, Barnes & Noble or ChristianBook.com! Whether you're a woman currently facing an unplanned pregnancy, a man whose partner is there, a friend or family member wanting to help, you'll find hope in the stories of others who walked this road and faced the same decisions. Is your pregnancy experience in your past? Regardless of what its outcome was, you'll find kindness, compassion, and healing. You've dealt with the pain long enough. It's time to discover your healing. By His stripes we are healed and by His sacrifice we are redeemed. What does it mean to be saved by the Blood of the Lamb? In this devotional written by Pelican Book Group authors, discover that, while life may seem to painted in multiple shades of gray, there is only one hue that restores body and soul and offers eternal life. RED inspires individuals to ponder the sacrifice of Christ—that FREE _gift which offers healing and salvation to all who believe. Compiled & Edited by Callie Smith Grant. Dogs are truly one of God's finest creatures, a marvelous gift for us humans. In the perfect follow-up to A Prince among Dogs, Callie Smith Grant compiles a delightful collection of true stories that celebrate the dogs in our lives. These stories will touch our hearts, renew our spirits, and show us how God made these wonderful creatures for unique purposes. Readers will love these uplifting glimpses into the lives of ordinary and extraordinary dogs and the people who love them. The stories are warm, captivating, and ideal for a good curl-up-and-read or a perfect gift for any dog lover. Karen Cogan, Kathleen Friesen, Kristen Joy Wilks, Lisa McCaskill, LoRee Peery, Marianne Evans, Marilyn Leach, Mary Manners, MaryAnn Diorio, Megan Lee, Merry Stahel, Natasha Deen, Nicola Martinez, Niki Turner, Pamela Thibodeaux, Robin Bayne, Sandy Nadeau,Susan Lyttek, Terri Weldon, Valerie Goree, Wendy Davy, Zoe McCarthy. ​Available in Ebook & Print. Watch the Book Video! Enjoy this FREE offering and great recipes from Pelican Book Group authors. Compiled by Robin Bayne.Join a variety of well-known authors as they share the Scripture or quotations they find inspiring to their writing. The devotionals they’ve contributed reflect all aspects of the writing life: basic motivation, rejection, publishing and succeeding. Spend some time with the writers you love and discover what words they write by. *Note* Editor and Compiler, Robin Bayne is publishing each of the devotionals on her blog: Between Sundays!